Affordable housing advocates are failing to consider the unintended consequences of fixating on a single cause. And their narrative is drawing attention away from the big picture. In his March 13 article, Rhonan Heitzmann sets out ”creative” ways to make more water available for new users. While some of his ideas for water conservation have merit, he certainly doesn’t encourage prudence when he says we should be “rejoicing at the natural abundance of our annual meter-deep rainfall.” I wonder if he has reflected more now that the Trust has declared a climate emergency. But it is the overall thrust of the article that is so disturbing. Mr. Heitzmann focuses almost exclusively on the water issue, arguing that if only we can secure enough water we will be able to have a “healthy community” with “sustainable housing” and a “sustainable population.” Water, it seems, is the only limitation to growth. He is absolutely correct that human innovation and technology can overcome pretty much any water shortage, but if that logic is taken to the extreme, what’s to prevent us from building desalination plants and rezoning the entire coast for condominiums? No, the problem is not just water, but development itself. 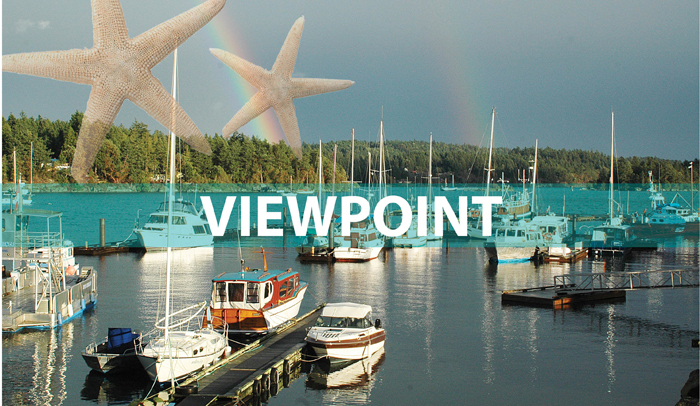 The Gulf Islands are supposed to stay rural and in their natural state as much as possible — not just now, but in perpetuity. That’s why the Islands Trust was formed and what the “preserve and protect” mandate is all about. Mr. Heitzmann seems to view major development projects as an opportunity to negotiate more affordable housing units. “What if a proposal was put to the developer…?”, he asks. It is this type of “let’s make a deal” attitude that undermines the integrity of the island. Unfortunately, our OCP allows the Trust to swap higher densities for “community amenities.” It sounds great, but in reality, serves as a honeypot for developers and a constant enticement for the Trust to upzone properties. “Affordable housing” has become a new lever for developers as it lends moral authority to any application. And pressure from housing advocates could help push more deals through, even though housing agreements are proving almost impossible to enforce. Next up is the “cottages bylaw”which seeks a blanket rezoning of 405 properties, many of them at the north end where water can be scarce. It is not known how many cottages already exist on the properties, nor how the proposed change, allowing year-round occupancy, will affect aquifers. There is also no evidence the bylaw will influence market dynamics and increase the stock of affordable housing. However, given the current situation and the focus of the last election, this may not be the worst option on the table. If the Trust wants to be effective without boosting densities, they should strictly enforce the ban on short-term rentals, and not hesitate to take recalcitrant owners to court. They might also ask to have the province’s empty-home tax reinstated (possibly with an exemption for long-held recreational properties). Consider what Finance Minister Carole James said about the tax: “We’re ensuring housing stock in our major cities is available for people who work hard and live in those cities.” If it works in cities, why not here? There seems to be a misconception that the current housing crunch is a one-off phenomenon we can deal with and then be done. Nothing could be further from the truth. We are surrounded by three large cities, and that means the people pressure will go on and on. If we respond to each new housing crisis by jacking up densities, there will be no end to it. The housing issue definitely requires attention, but let’s not forget Salt Spring is a protected area much like any federal or provincial park. If we follow the same planning model as other outlying communities in the greater Vancouver/Victoria region, this island will disappear in the melting pot. We must do all we can to avoid such an outcome.